Standard Duty PVC Clear Corrugated Helix Water Suction Pool Hose which is also called helix reinforced suction hose, corrugated suction hose, clear water suction hose, pool suction hose and pump suction hose etc. 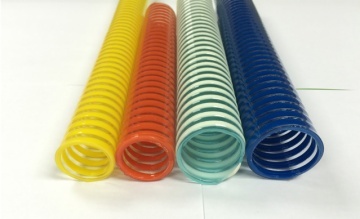 Which is high quality PVC suction hose designed for a wide variety of suction or transfer applications. Widely used throughout industry in both positive and negative pressure applications, ideally for conveying and suction of water, oil, powder, granules in pump industries, constructions, mining industries, chemical factories and many other industry applications. Flexible and durable PVC was extruded together with the rigid helix reinforcement, both bore and cover are smooth, with low friction loss, easy for dragging. Excellent flexibility, light weight, crush and abrasion resistant, smooth tube for less friction loss, smooth cover allows easy dragging, weathering resistant, clear to have full visual flow of materials, corrosion resistant to light chemicals, various lengths available and can be supplied with different couplings and clamps, ideal replace for bulkier and heavier ply-wrapped rubber hose. High temperature will reduce the available working pressure. Don't use this hose in the applications where static may develop unless externally grounded. This hose can be made with food grade for food and beverage handling.